February 2015 saw the 70th anniversary of the bombing of Dresden, a contentious and highly debated element of the British and American war campaign. The deaths of 25,000 civilians and the destruction of the medieval city of Dresden known as the “Jewel of the Elbe” was without doubt one of the low points in the British military strategy. On 13th February this year Germany held one of their rare commemorations for their own dead. 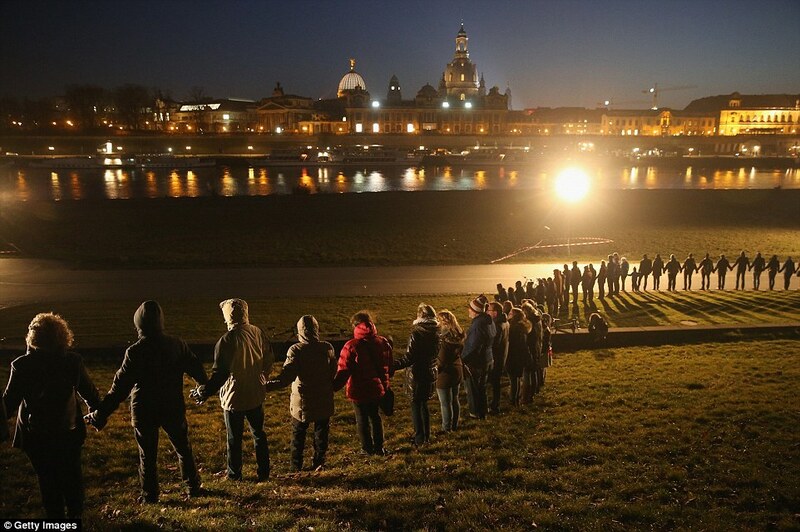 It started with a service in the re-built Frauenkirche / Church of our Lady and continued later in the streets when up to 10,000 people formed a human chain along Dresden’s riverfront, holding hands to commemorate the dead and call for peace. With my on-going interest in World War commemorations, this was of course a significant one, for two reasons really. On the one hand it remembers German victims of war and on the other it remembers an event that many people see as a British war crime.